“Alexa, play a song for me!” a daily scenario? The voice assistants these days can perform simple tasks for you and make your daily life simpler. You might like it when your voice assistant can perform tasks on your behalf and reduce your efforts just with a simple voice command. By the end of 2019, a forecast states that there will be 22.7 million US smart speaker voice buyers, making up 32.5% of US smart speaker users. Wouldn’t you agree that virtual assistants have become popular? They are helping us with many aspects of life, from sending hands-free messages and texts to creating lists, playing music, finding nearby restaurants and many more. What makes the voice-based interface popular? One of the major factors is, it helps you to multi-task. Unlike the mechanical interfaces, voice interface can increase productivity which cannot be achieved by the standard interfaces. You can order pizza at the comfort of your house just by talking to your voice assistant. This simple voice command replaces the monotonous repetitive steps your customers would have to follow while ordering over the web or the mobile phone. We can see people adopting voice assistants at an increasing pace. A study predicts that voice shopping will account for $40 billion in U.S. consumer spending by 2022. It is essential for you as an e-commerce company to fit into the gaps and leverage on the $40 billion voice commerce market. Before gaining an understanding of how to go about it, here are the advantages of aligning your business with voice commerce. Voice commerce can provide great potential by removing hurdles from the purchase path. It facilitates the streamlining of customer experience (CX). It would reduce the customer’s effort needed in making a purchase. With more advanced voice support, products will be more accessible than ever. Customers can now use the voice assistants (Alexa, apple pod, Siri, Cortana etc.) to place an order and their voice assistants can make the purchases for them. Continuous interactions with the voice assistance provide data on the customer interactions which in turn helps in creating a personalized experience for your customer. Companies and brands can develop effective marketing and product strategies by understanding the insights on customer’s behavior, preferences and order history. What should you consider in voice commerce? The next step for the successful adoption of voice commerce is understanding what you should be considering in voice commerce. It is critical to understanding how to go about adopting new technology. Voice commerce can turn out to be another source of revenue for your e-commerce. If your customers are already on voice-based assistance, it is worth your investment to gain a competitive edge. It will help you generate sales and create new possibilities for your e-commerce business. Who wouldn’t want to leverage on a new source of revenue? You can start investing in the technology by understanding the touch points which voice commerce can address for your business. People would speak to the voice assistants to perform tasks for them. 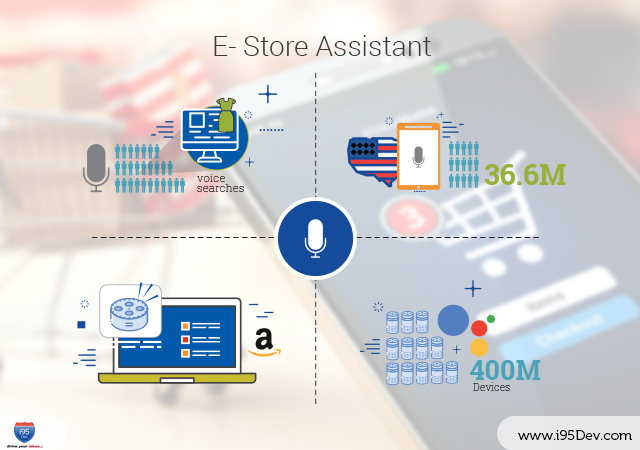 It becomes quite important to develop an effective voice search for your e-commerce business to improve the shopping experience for your customers. You must also consider how you deal with the important attributes like product descriptions, vendors, prices and so on. Placing orders by voice is quite different from ordering via a laptop or a phone. You must develop quick methods to share information via your customer’s voice assistant. Now, consider this, what if you can shop with a simple voice command? Yes, what seemed like a far-fetched dream isn’t imaginary anymore. Shopping with just a voice command is now possible with the growing technology. We at i95Dev were considering how we could contribute to voice commerce. One of our Tech leads found voice assistant really fascinating. That’s when he thought on the lines of bringing in voice assistants into the e-commerce world. He came up with his innovation, the E-store Assistant. E-store Assistant has developed by i95Dev has wider applications and can be an amazing support tool for customers shopping online. But, the major motivation that drove us towards the innovation is our customer Mobility Express. Context 1 – Mobility Express supplies products for differently enabled consumers and i95Dev wanted to make shopping a seamless experience for them – while keeping things simple. Context 2 – In addition to this, they heard a lot about how voice commerce will soon be the next big thing, however, they saw very few use cases of voice being leveraged to drive commerce. i95Dev decided to bring these two contexts together and build a POC for Mobility Express – they wanted to enable Mobility Express’ customers to interact with their e-commerce store without any additional hardware or tools. The E-store Assistant is a lightweight tool that requires very little modification to work seamlessly with any Magento e-commerce store. The application of the E-store Assistant is not limited to a small segment of end customers. It can be extended to act as an aid for store administrators to do things quickly and efficiently. It can also be extended to work with other devices like TV and in-store displays and emerging technologies like chatbots, VR, and AR. You must have by now understood the possibilities and the revenue voice commerce can bring in for you. You can benefit exponentially with the digital assistants. You can reach out to us to help you with the adoption of voice commerce for your e-commerce business. So, the next time someone calls out to a voice assistant to make a purchase, be ready for them!